2 bedroom/2 bathroom LOG CABIN in the Arts and Crafts Community in Gatlinburg TN. 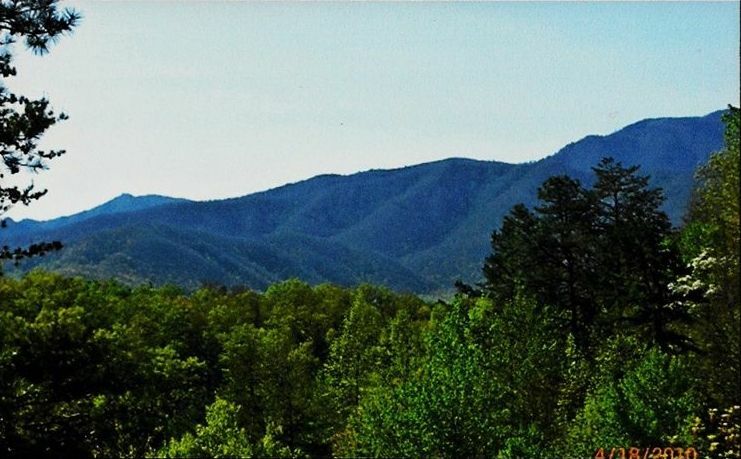 Sit on the front porch listening to only nature looking out at the Smokey Mountains. Look to the right and see Mt LeConte. Forget your daily stress and enjoy what God has given you. This two bedroom cabin offers a king bed in the loft ajoined with a full bath and a separate room with the jetted tub. Down stairs has a second bedroom with a queen size bed. Next door is a full bathroom. The living area has a queen size sleeper sofa . This cabin (God's Gift) has a fully equipped kitchen, for your cooking needs if you choose to eat in. The living area has a gas fireplace, we have books for your reading pleasure . There is a air hockey table for the kids. We provide all linen and towels. God's Gift is conveniently located to Gatlinburg, Pigeon Forge, Sevierville, Cades Cove, and Townsend. There are endless things to do. God's Gift is a spacious and luxurious!!! 1035 square feet of fun. This cabin has 1 queen bed, 1 queen size sleeper sofa, and 1 king bed in loft. Full size washer and dryer in basement. ••Gas logs turned off in April turned on in November. We do not give refunds or compensation of any kind for acts of God or power outages. Psalm 24:1 The earth is the Lord's and all in its fullness, the world and those who dwell therein. We love spending time in the mountains enjoying nature. Wonderful view, beautiful cabin, terrific location, with endless things to do. Mountain tours, national park, rafting, hiking, dinner shows, horseback riding, shopping, and just relaxing. Satelite TV in livingroom, loft and bedroom on main level. Beautiful cabin, all the comforts of home and much more. We loved all the special decorations in the cabin, we loved the view of the mountains on the back deck as well. This lovely cabin added so much to our vacation. And we are very grateful, thank you! Every was very nice. Air conditioning was not working when we arrived but was taken care of very quickly. Only one thing I would change is a place to store groceries. We like to cook and after a visit to the grocery there was no room to store staples. This cabin is really clean, with charming decor and a terrific view from the porch . I really enjoyed my stay here. The bed seemed brand new, and the furniture is comfortable. The laundry is in the clean and bright basement- with 2 washers! The only reason I didn’t give it 5 stars is I would have liked one good skillet and one good knife. I stayed there by myself, so I cooked most meals, and I did miss a really well stocked kitchen. Overall, I recommend this cabin and would rent it again. My family had a great time and it have everything that we needed. This was our get away to just breathe n relax!! The cabin fulfilled our expectations. Comfortable, clean, with a beautiful view of the mountains. We will definitely rent it again and recommend it. rent for 7 nights only pay for 6. Cancellation Policy: CANCELLATIONS - A 30 (thirty) day notice is required for cancellation.Cancellations that are made more than 30 (thirty) days prior to the arrival date will incur no penalty. ***NO pets, violators will be charged a minimum $250 additional cleaning fee. *** Cancellations or changes that result in a shortened stay, that are made after 30 (thirty) days of the arrival date, will forfeit the full advance payment. Cancellation or early departure, power outages, or acts of God does not warrant any refund of rent. All credit card cancellations are subject to a 5% cancellation fee.